The guys at Irwin Landscaping (PO Box 186, Hockessin, DE 19707) were busy this year helping to create the central feature and numerous other exhibits. That’s in addition to their vown delightful scene modeled after a Parisian park. Wire copper statues of children dance across the grass as a life-sized sailboat filled with red kalanchoe glides across a wave of light blue pansies. Cherry trees, azaleas, and fragrant viburnums enhance the charm of a Parisian spring and colors in the exhibit echo the French flag. Simply lovely! 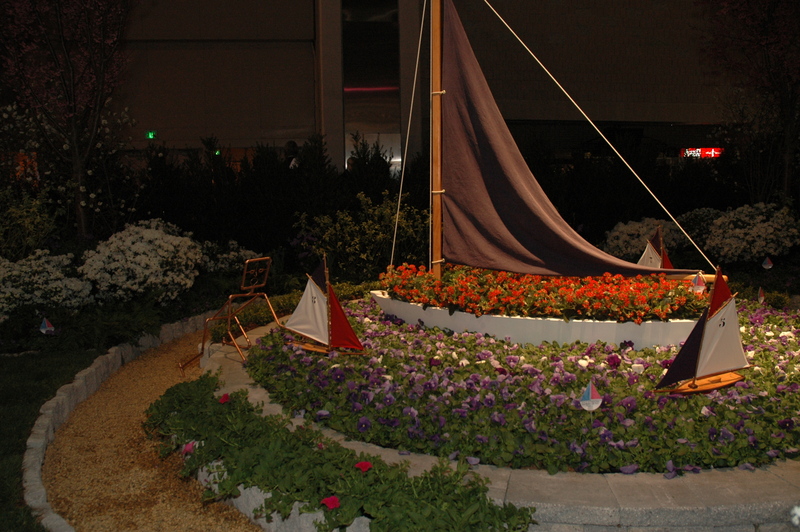 What kind of Topiary will Irwin Landscaping Create for the 2010 Flower Show? It is a wonderful design dilemma, says Peter Irwin, owner of the Hockessin, Del.-based company that will exhibit in the Flower Show for its third year this year. In 2008, for the New Orleans-inspired Show, “Jazz it Up!” Irwin did alligators and frogs. In 2009, for the Italian-inspired Show, “Bella Italia,” Irwin did large wine bottles.